I purchased this dock to use it with my fresh MacBook Pro 15″ 2017. This is one of the few docks advertised able to power the 85w needed by the laptop to work properly. If you are interested only on the technical review, skip the immediate below section where I describe how difficult was to buy the thing in the first place. I live in Switzerland, and I ordered this product from the German store (there isn’t a Swiss one), this was a whole nightmare. They did not allow me to ship the dock to a PO box I have in Germany because they said they dont deliver to PO boxes, why? Who knows. I buy a lot of things around Europe, not one single company ever denied me to deliver to the postal address I frequently used, so I decided to call them and ask them, what a bad idea I had. Although I live on the German speaking part of Switzerland, I still dont speak the language (its really difficult), so when I called to their German phone support, I selected to speak in English through their phone menu. To my surprise every single time I selected the English option, I was hanged up by the system. I waited some days to see if this was an error, still being hanged up. I sent an email, which they never replied. I decided to be “wild” and try the German option. A person who seemed willing to help was talking in German, I was trying to explain the whole situation in German while mixing in English. After 30 minutes of struggling to understand and communicate the agent noticed that I spoke Spanish, so he briefly said to me in Spanish: “I am sorry, we are not allowed to speak in any other language rather than German”. He confirmed me that although we both could talk easily in Spanish, Belkin´s policy was to NOT allow them to speak in a language we (agent and customer) could communicate. How stupid is that? I work as a coordinator of a Global Service Desk, this is one of the worse things I ever heard from a company policy, I am still shocked. Still the agent was very helpful and even called me back from a blocked number and after his shift has ended (maybe from his own personal mobile?) and helped me to ship the device to the house of a colleague of mine who lives in Germany. The agent was very kind, its just unfortunate that Belkin´s support policy is so bad. Ok, so I got the dock, now what? The Thunderbolt 3 dock is really unreliable, it constantly hangs, I have to unplug it and re-plug it at least once a day, the ethernet port just stops working and I need to unplug the cable and replug it to make it work again. If I connect speakers to it (front or back), when I turn off my computer it starts making pop sounds every minute, very annoying. I contacted Belkin support and they are worse than their own product. Over email, they asked me to call them to a US number, where after a lady kept me on hold for 45 minutes she told me she will be writing back to me. Of course nobody cared, nobody followed into the issue either even after having a couple of cases assigned (08848570 and 08923164). This is the first thing I teach to my team: Follow up on every single ticket. I guess the Belkin agents didn’t get this message…or the management doesn’t allow them to really help their customers, I wouldnt be surprised at this stage. Its really frustrating to see what could be a great product not only work so bad, but not having the company who built it supporting it properly. Its not a cheap product costs around USD 300 to 350, so I have no idea why they dont do it properly. But dont just take my word for it, check the following link on the Apple Store were a lot of more people is also having issues like this. On the meantime if you need a Thunderbolt 3 dock, look somewhere else because Belkin did not finish baking theirs. Belkin sent a replacement unit of the dock, I changed it completely (cables, power adapter, etc.) the same problem occurs. Ethernet is lost, the computer is sent to stand by after a long period of not using it (for example overnight) when its configured not to be on the software side. If I wake up the computer the dock is never working again until I unplug it and plug it again. I also tested with another Mac, same issues. 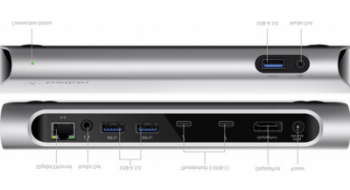 This just confirms that the Belkin Thunderbolt 3 Express Dock HD was produced with defects, something really sad as it is not a cheap product. My suggestion: Buy another dock, dont ever buy this Belkin one until some really takes care and fixes it. Whatever you buy just ensure it has enough power (85w) to charge your MacBook Pro 15″ if this is the model you have.